Published: Sept. 14, 2013 at 08:52 p.m. 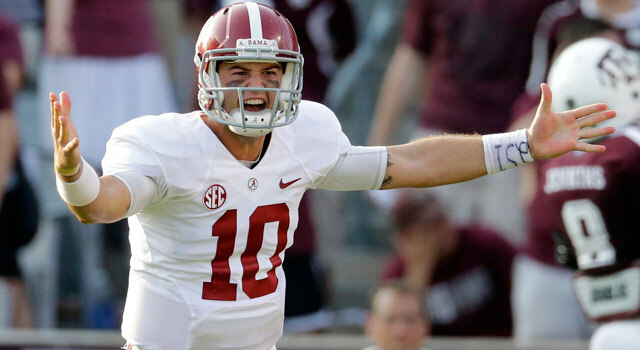 Updated: Sept. 17, 2013 at 03:13 p.m.
AJ McCarron was very complimentary of his left tackle after Alabama's win over Texas A&M. 1. Game manager? He's no stinkin' game manager! 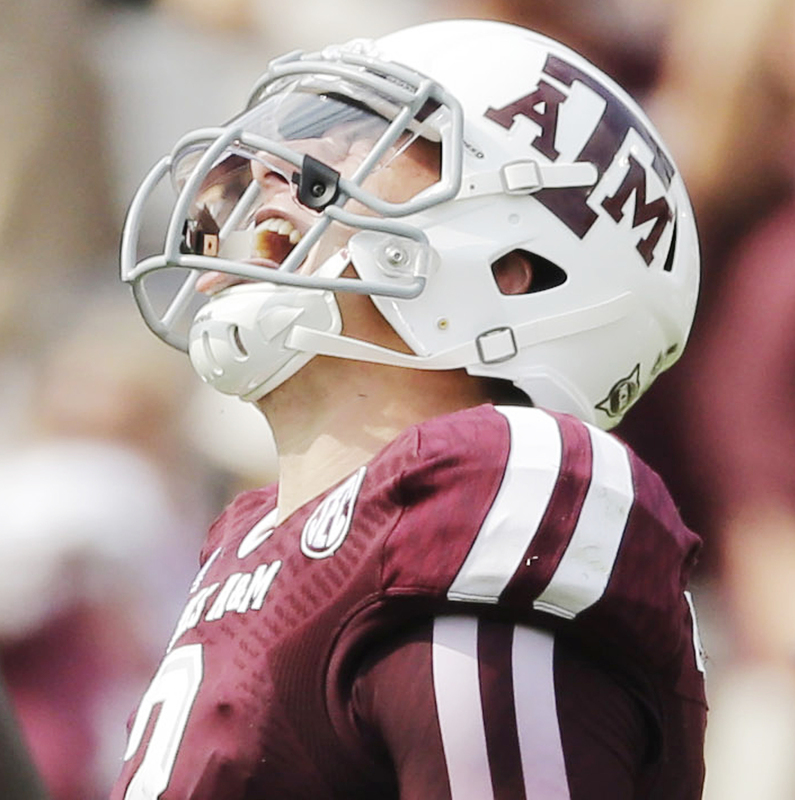 Check out the top 10 images from the third weekend of college football play. Would the last armchair quarterback who still thinks Alabama's AJ McCarron is "just a game manager" please turn off the lights? The Crimson Tide quarterback may have just placed himself in the Heisman Trophy race with 339 yards passing and four touchdowns in what was billed as the biggest football game in Kyle Field history at Texas A&M. Alabama left offensive tackle Cyrus Kouandjio, one of the top NFL prospects in college football's junior class, rebounded from a poor performance against Virginia Tech two weeks ago with a stellar effort Saturday in a 49-42 win over Texas A&M. "He kept me out of the grass all day," said quarterback AJ McCarron, referring to Kouandjio's task as his blind-side pass protector. Kouandjio said Texas A&M tested Alabama's revamped offensive line with a variety of blitzes. "All they did was blitz," said Kouandjio. "It was like, 100 blitzes. Almost every play. We did a good job of communicating the blitz and worked off of it in this game." Kouandjio was flagged twice for holding and missed a few key blocks against the Hokies in the first week of the season. 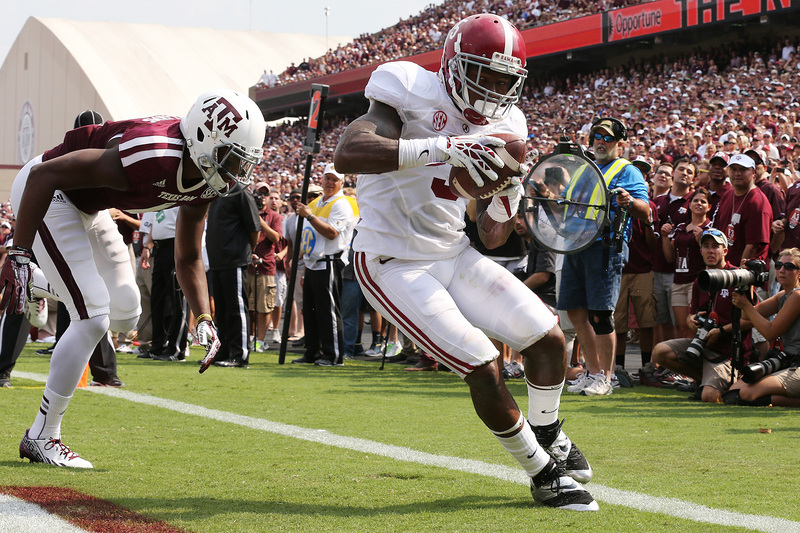 Against A&M, he looked like the potential first-round pick he has been projected as. Johnny Football does the juking. He doesn't get juked. Unless, of course, he's trying to make a tackle. See Alabama safety Vinnie Sunseri make a subtle move to induce a whiff by Manziel during an interception return Saturday. Tennessee's vaunted offensive line wasn't enough to keep the Volunteers' game with No.2-ranked Oregon close. With four out of five starters expected to be in the NFL within the next two drafts or sooner, the Vols had hoped to at least shorten the game with a decent rushing attack. It didn't happen. UT averaged less than four yards per carry. One of the bright spots for Kentucky in a 1-2 start to the season has been the play of its defensive line, which includes a few legitimate NFL prospects. Kentucky defensive tackle Donte Rumph, potentially, is the best of those. But a shoulder injury knocked him out of the Wildcats' loss to Louisville. A senior and third-year starter, Rumph (6-foot-3, 320) was fairly disruptive in the interior last season with six TFLs and four sacks. Rumph's status for next week's home game against Florida, where his presence will be sorely needed, is unclear. Kentucky's Za'Darius Smith got into the sack column for the third consecutive week, picking up an assisted sack against Louisville. That gives Smith 4.5 on the season, keyed by a three-sack game against Miami of Ohio. The Wildcats' new edge rusher, a JuCo transfer, is quickly becoming one to watch. Check out the cheerleaders from the SEC in action. Isaiah Golden was dressed out for Texas A&M Saturday under heavy-hearted circumstances Saturday, having had to bury his two-month-old daughter, Avery, earlier this week. TAMU coach Kevin Sumlin had indicated Golden would make his own decision on whether to return to the team Saturday or stay with his family. Chris Smith of Arkansas joined Kentucky's Za'Darius Smith as the only SEC players to record a three-sack game this season with three of his own in a win over Southern Miss. Smith is Arkansas' top pass rusher. At 6-foot-3, 268, however, he is somewhat undersized for an NFL defensive end. Mississippi State safety Nickoe Whitley made a big return to the lineup Saturday after missing last week's game with an injury. Whitley picked off a pair of passes for 42 yards in interception returns against Auburn. Whitley is among the top senior defensive backs in the SEC. After a slow start to the season, South Carolina receiver Bruce Ellington turned things around against Vandy with a 111-yard receiving night on eight catches. It was overdue for the Gamecocks' leading returning receiver. Can anyone hold Vandy receiver Jordan Matthews under 100 yards? In a losing cause, the senior did it again Saturday with 106 yards on eight catches.